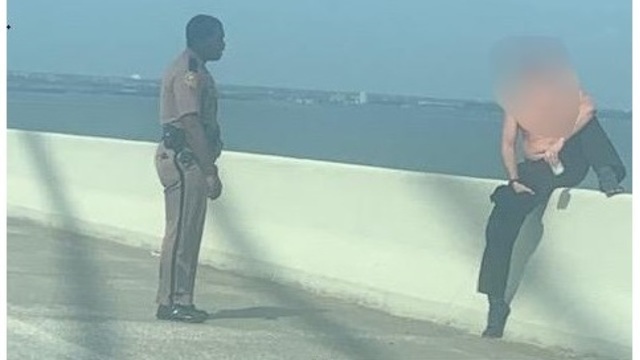 PINELLAS COUNTY, Fla. (WFLA) - A trooper prevented a suicidal man from jumping off of the Sunshine Skyway Bridge on Sunday, according to the Florida Highway Patrol. At about 1 p.m., the agency got a call about a "suspicious person" standing on the wall of the bridge on the northbound lanes of the roadway. FHP trooper Tabarie Sullivan arrived at the scene and saw the man on a concrete barrier. "He had no shirt on and he was drinking a Dr. Pepper," Sullivan told WFLA. The man had one leg dangling off of the bridge and his other foot planted on the roadway. Sullivan approached the man and began talking him down from the wall. "I told him, 'Sir, please don't do it. Don't do it today, you have more to live for.' He explained to me, 'No, actually, I don't'," the officer recalled. The man told Sullivan that he had recently accepted Jesus Christ as his Lord and Savior and "was completely okay," with ending his life. "He had recently got an injunction with his wife and kids, so he was not able to see him and he would be completely okay with jumping off the Skyway Bridge to commit suicide," Sullivan remembered the man saying. Sullivan said he offered a listening ear and asked if there was anything he could do to help. "We just talked a little bit about life. I'm also married, I have a kid as well, so we discussed that. We laughed and joked," the trooper said. After a few minutes, the officer noticed the man had his other leg back over the barrier. "I knew that was my chance then, so at that point, I just jumped on him, and I pinned him down and I waited," Sullivan said. Captain Richard Benton, an off-duty trooper happened to be passing by on the bridge and stopped to help Sullivan get the man off of the wall. "Both were able to successfully detain the subject without incident," Sergeant Steve Gaskins said in an e-mail to WFLA. Gaskins did not provide any further information regarding the man's condition. "The entire time I'm thinking, I cannot let this man jump off this bridge. He needs to understand there is more to live for and this too will [sic] pass," Sullivan said. Unicoi County Sheriff Mike Hensley said police responed to a stabbing on Brown Lane in Erwin. MADISONVILLE, Tenn. (WATE) - A couple from Madisonville, Tennessee is just getting back from a trip to Sri Lanka. The Tennessee Education Association encouraged all teachers to organize rallies in opposition to Governor Bill Lee's plan to create education savings accounts, money for students in under-performing districts to go to different schools. With a measles case in East Tennessee and the number of reported cases nationwide approaching levels not seen in 25 years, it's time to brush up on measles.